Malvern, PA, September 23, 2016	(Newswire.com) - ​​​Zoomi, a performance optimization data analytics company, today announced a first-of-its-kind partnership with The Workshop School, a progressive West Philadelphia high school, to conduct research into the new ways to measure a student’s performance based on behavioral indicators. A project-based high school, the Workshop emphasizes skills that are overlooked by standardized tests, such as project management, collaboration, commitment to improve, and critical thinking. Learning how to effectively measure these skills is central to the school’s mission. Central to the partnership is the algorithmic analysis of behavior patterns to predict learning outcomes with greater accuracy. These capabilities are based on Zoomi’s existing algorithms and analytics currently used in the corporate training space. At the Workshop, they will be used to look for differences in work patterns between students who excel in project work and those who struggle. "Using our first-to-market predictive and prescriptive analytics, we will work alongside The Workshop School to develop a set of tools that can accurately determine which factors we should actually focus on when assessing student performance,” said Dr. James Walker, executive chairman, Zoomi. “We see great opportunity to apply our existing algorithms to K-12 education. In addition to our corporate business, we originally developed Zoomi with a social mission in mind as well. Similar to its application in the corporate world, this technology can also be used in education. With these insights, we can change the way student performance is assessed." In partnership with The Workshop School, Zoomi will design and field test new ways to measure students’ online work behavior. The goal is to develop new, performance-based measurements of skills the school already prioritizes, as well as identify new competencies associated with student success. 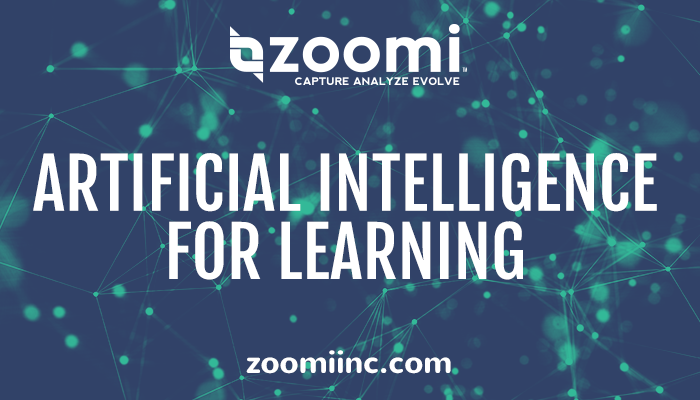 Originally developed to provide individualized training content in the corporate space, Zoomi gathers behavioral data, which is then analyzed by machine learning algorithms to identify behavior patterns. Early in the learning process, Zoomi can identify which learners are likely to retain information, who is achieving proper knowledge transfer and who may be struggling with course content. The partnership with The Workshop School provides Zoomi the exciting opportunity to utilize its technology to push the boundaries of how educators quantify learning in K-12 and higher education. Zoomi and The Workshop School will work closely during the 2016-2017 academic year to design and field test the technology in order to capture and analyze evidence of student performance. The Workshop School, located in West Philadelphia, provides high school students with a unique educational experience for the purpose of unleashing the creative and intellectual potential of young people to solve the world’s toughest problems. The school puts real world problems at the center of the curriculum and evaluates students’ work based on the progress they make in defining, exploring, and ultimately developing solutions to those problems. Students engage in projects that allow them to engage in hands-on work directly addressing issues within society and resulting in work that can be evaluated using real-world standards. For more information on projects the students have taken on, visit http://www.workshopschool.org/student-projects/. In addition to working on their projects, students are required to attend seminars designed that build knowledge and skills to both reinforce project work and prepare students for college and careers. 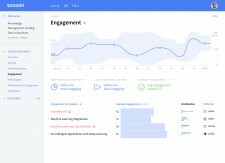 ​Zoomi, a performance optimization data analytics company, brings together the disciplines of predictive and prescriptive analytics, machine learning and data mining to glean insights and intelligence about a learner’s behavior, cognitive and engagement preferences to synchronize learning with business outcomes. Zoomi’s first-to-market technology delivers measurable ROI for corporate training and education programs. The company was founded in January 2015 by a global team of industry-leading engineers, developers and designers. Zoomi’s headquarters are in Malvern, PA. For more information or to request a demo, visit www.zoomiinc.com. Zoomi is a performance optimization data analytics company. 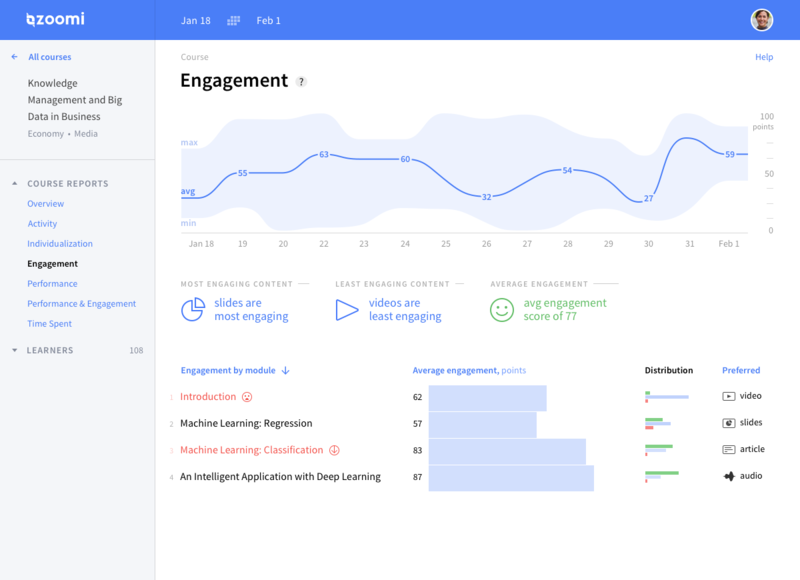 We utilize machine learning and data mining to glean insights and intelligence about the learner's behavior, cognitive, and engagement preferences.